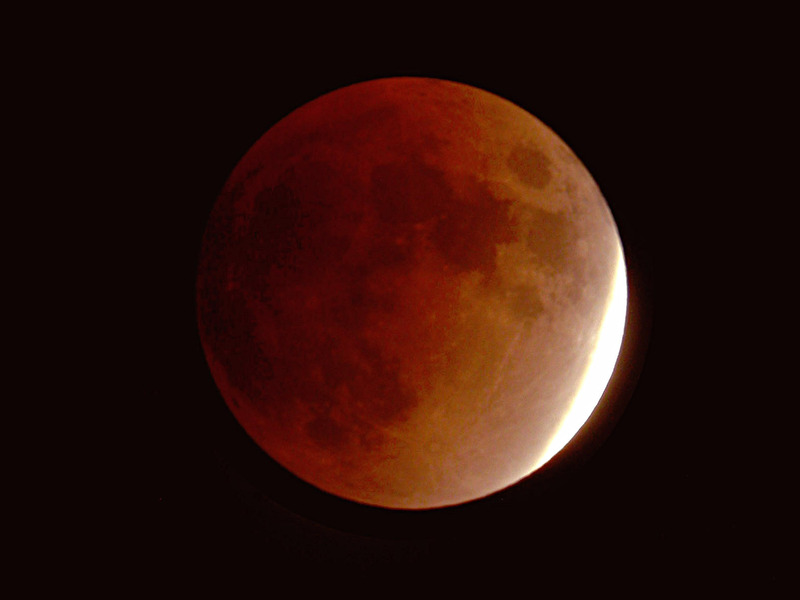 Once when I was a kid Mom and Dad and my brothers and I sat out in lawn chairs until midnight or maybe later to watch a total eclipse of the moon. We only did it once, but it’s always stuck in my mind as Reason #4,769,341 why My Parents Are Awesome (that’s actually a pretty high rank, considering how many museums, zoos, turtles, cats, chickens, model rockets, hikes, skinned knees, dirt clod fights, movies, puzzles, trips to the bookstore, vacations, homeworks, county fairs, kolaches, and giant pans of lasagna went into our upbringing). 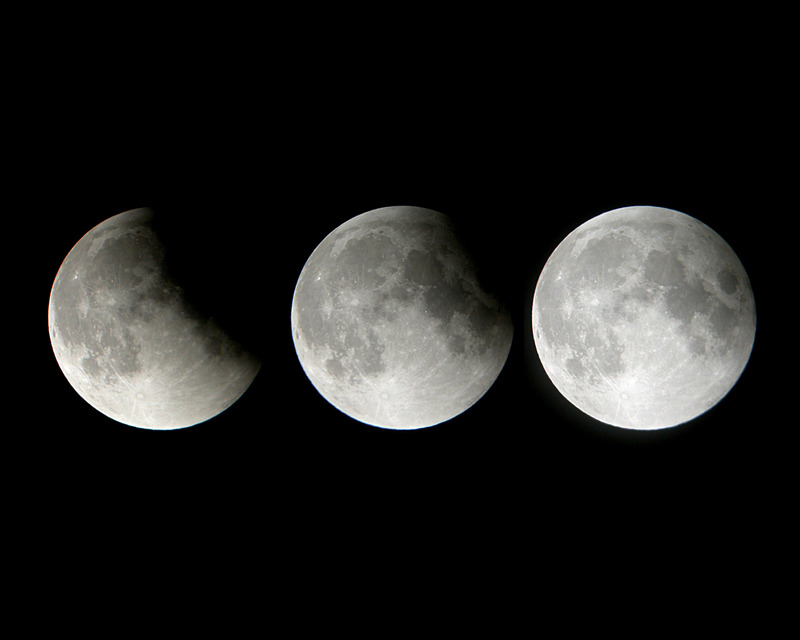 The night of February 20, 2008, there was a total eclipse of the moon. It started at 5:45 PM and ended a little after 9:00 PM. We were living in Merced at the time, and I’d only been into amateur astronomy for a few months. London and I watched the eclipse from the back porch, and Vicki came out a few times to look, too. 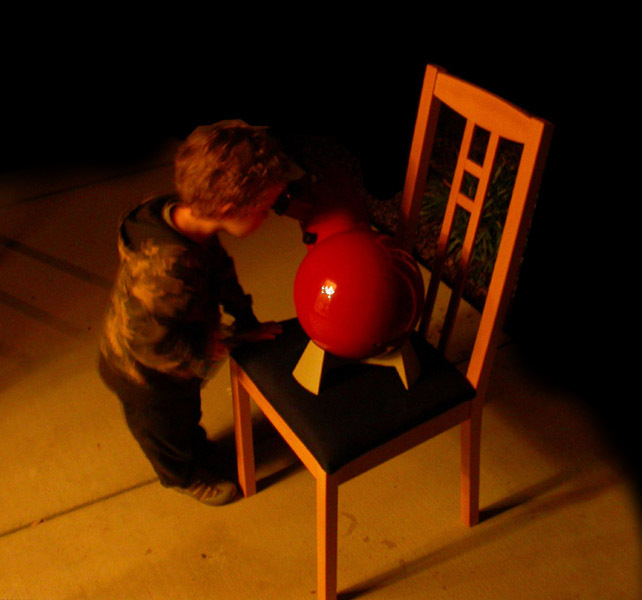 The “baby red telescope” (a used Edmund Scientifics Astroscan) was my Valentine’s present from Vicki that year. London loves it and at the time he was very possessive about it, but we talked about it and he decided to share. He was just three when these pictures were taken; he’s seven and a half now. I passed this Astroscan on to a friend, but I got another just for London. They are nearly indestructible scopes. The newest versions from Edmund Scientifics have red-dot sights, but the old ones have a metal peepsight, so there is typically zero user maintenance. That doesn’t sit well with everyone–for one thing, there’s no provision for collimating the mirrors so if they slip out of alignment, you’re basically stuck. Unless you want to disassemble the telescope, that is. 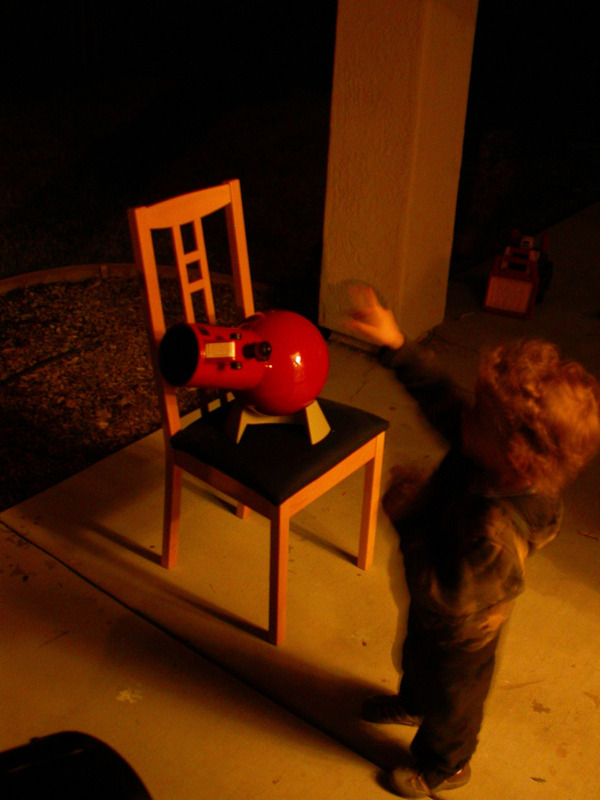 For the brave, Gary Seronik posted instructions on how to disassemble, collimate, and reassemble the Astroscan. The tank-like build of the scope is a big selling point. We often take London’s Astroscan when we go camping, because we can always find enough room for it in the car and we don’t worry about it getting banged up. I have read about people who leave their Astroscans in the trunks of their cars on a semipermanent basis so they’re never without a scope, and about Astroscans that have tumbled off tables and tripods and been none the worse for the wear. One of my favorite observing sessions with the Astroscan was in Yosemite Valley with some ecology students on a field trip. A group of us drove out into the middle of the valley to get out from under the trees, set the Astroscan on the hood of the truck, and spent a couple of hours just cruising the skies. One of the students had never seen Saturn before with his own eyes. It was tiny in the Astroscan–the short focal length limits the magnification–but very sharp, and he stayed hunched over the telescope after everyone else had gone off for some naked-eye stargazing. I will never forget that night; I was so glad I had a scope along and could show people a little of what’s up there (this was about a year before I started doing sidewalk astronomy). If you want to read up on the Astroscan, the review at dansdata is funny, Tony Darnell has an inspiring writeup here, and Ed Ting’s review is both thorough and charming. If you actually want to buy an Astroscan, you have a choice of paths. The new Astroscan version with the red-dot sight is called the Astroscan Plus, and Edmund Scientifics will sell you one with two eyepieces and a shoulder strap for about $250. For an additional $180, the Astroscan Deluxe package includes a third eyepiece, a sun-projection screen, a tote bag for the scope, and a full-size tripod for getting it up off the ground. However, you can probably have an Astroscan for a lot less dough if you want. The scope’s basic indestructibility and absence of things for users to fiddle with means that, apart from the switch from the metal peep sight to the red-dot finder, 20-year-old Astroscans are about the same as the ones rolling off the assembly lines today. And the scope has been in production since about the time I was born, so there are a lot of used ones out there. I’ve bought two used Astroscans, the one I passed on and the one London still has, and I found them the same way: put ‘Astroscan Craiglist’ into Google and see what comes up. You might have to do this on a regular basis over the course of a few weeks to find one that is (a) in your area and (b) in your price range, but they do turn up with surprising regularity. You can also find them on eBay sometimes, but usually being sold more dearly. Expect to pay $100-150 for a used Astroscan, although I have seen the occasional one pop up at $75 or even $50 if someone finds one in the back of the closet and just wants it out of the house. In terms of price and aperture, the Orion StarBlast 4.5 ($180-200)and SkyScanner 100 ($110) are clearly intended to compete with the AstroScan, and if you’re just looking for a reasonably sturdy, portable, 4-inch widefield reflector, either of those would do nicely. But the Astroscan is more maintenance-free (in that it has no provision for user maintenance–whether this is a bug or a feature is up to you); solidly built to the point of near invulnerability; and has a distinctive charm all its own. I suspect that at this point most people don’t end up owning an Astroscan because they wanted a small telescope, but because they wanted an Astroscan specifically. If that’s you, go nuts. It’s an awesome little scope. Great article, and useful for future observations. I got my Astroscan for Christmas after wanting one for 30 years. It has not let me down.